Records in a Journal: Cinnamon Gardens - Among the very best of fiction! Cinnamon Gardens - Among the very best of fiction! What is the raft of "Will" and "Wont"
Tirukkural will always remain Tamil literature's towering contribution to the world. Every chapter of Shyam Selvadurai's Cinnamon Gardens begins with one pertinent verse from Tirukkural. When I smelled and leafed through the pages of this book at the library, as I usually do, I instinctively felt I should read it. After a long time, this novel captured my interest and held me spellbound. The amount of research that has gone into this work is admirable and deserves special mention. Set in erstwhile Ceylon in the 1920s, Shyam has managed to capture that epoch exceedingly well. In every period in history, there are customs and traditions that are sacrosanct and inevitably in every period, there are people who dare to defy these customs. By their acts and deeds, these men and women come to exemplify the battle between the old and the new, the conservative and the liberal, the tolerant and the intolerant and the subservient and the rebellious! Cinnamon Gardens is the story of some of these men and women, how, life to them, is claustrophobic and constraining, how, they struggle to express their feelings in an environment that views them as outcast for who they are! 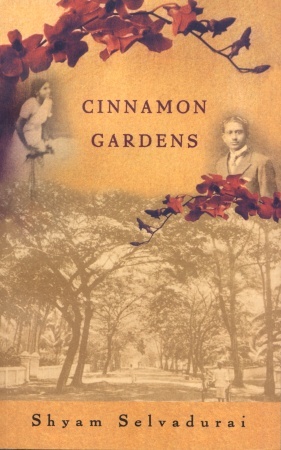 The caste system, woman's rights, questions of nationality, labor rights, infidelity, the Sinhalese-Tamil equation and simmering tensions, gay rights - all these - set in a upper class suburb of Colombo, with the Sea serving as the backdrop - come to life through characters sketched with the skill of a master craftsman. I kept turning the pages in feverish haste and not even a single instant, I was disappointed. One's heart would immediately warm up to the characters of Annalukshmi and Balendran. The scale of imagination, the simple, but powerful language and the attention to minute details together result in a hugely rewarding read. A must-buy for lovers of literature, fiction and history! One review summed it up best here - " Sensual, perceptive, and wise, Cinnamon Gardens is a novel of exceptional achievement – an exquisite tapestry of lives."